Did you love our brown lentil soup recipe which was published in our blog a little while ago? Here is another great dinner idea - it's healthy, quick and tasty. Step 1: Preheat oven to 200°C. Cut onions into 5cm lengths. Remove seeds from capsicum. Peel carrot. Finely shred all vegetables and place into a bowl. Toss until well combined. Step 2: Line a baking dish with baking paper. Place fish fillets into prepared baking dish. Top each fillet with shredded vegetables. Drizzle with soy sauce. Season with salt and pepper. 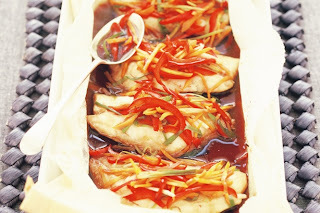 Step 3: Place another sheet of baking paper over fish. Fold all sides of baking paper together to form a parcel. Place dish into oven. Bake for 12 to 15 minutes, or until fish flakes when tested with a fork. Serve with rice or noodles.